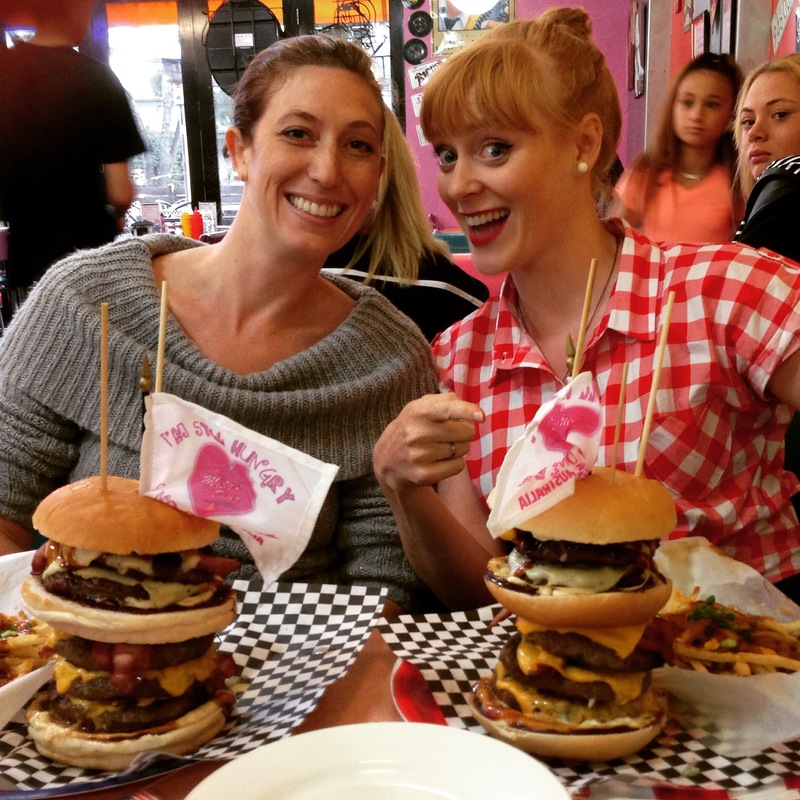 The Misty’s Diner Burger Challenge. I’m breaking up with burgers. Specifically, I’m breaking up with burger challenges. Or challenges of any kind that involve things like bread and cheese. Why? You may want to sit down for this. The Hungry Ginger is allergic to Gluten. On top of that … I’m also Lactose Intolerant. Seriously mother nature what the F$%&? That means no more bread, pasta, PIES, cake, cupcakes, sausage rolls, BEER, cereal, biscuits, gravy, CORN CHIPS … seriously the list is long and depressing. Also cheese … I’ve known I can’t eat dairy for ages but haven’t ever been strict about it and just “dealt with the consequences” to which my doctor replied “If you’d like to keep poisoning yourself go right ahead” … 😦 Fine. Pretty darn confident going into this one, I knew I had 14 minutes and 4 seconds to down a 5 pattie, 5 slice of cheese, 2 bun, 5 rashers of bacon, a whole lotta mayo and BBQ sauce and a half serve of fries. Honestly, I thought “how hard could this be?” I was so confident I managed to convince a friend to join me. 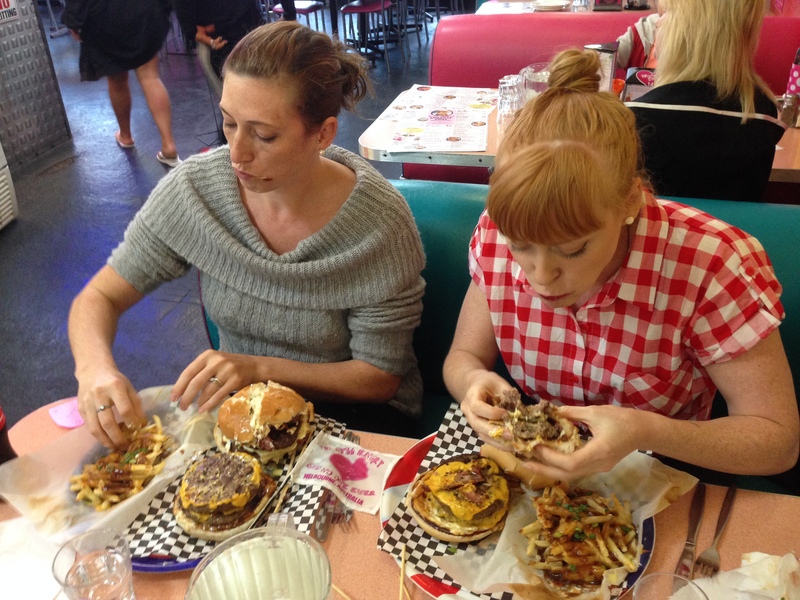 A proud American ‘Bamma’ jumped at the chance to try and down a ‘big ‘ol merican burger’ challenge. We were keen as French’s mustard to smash it! 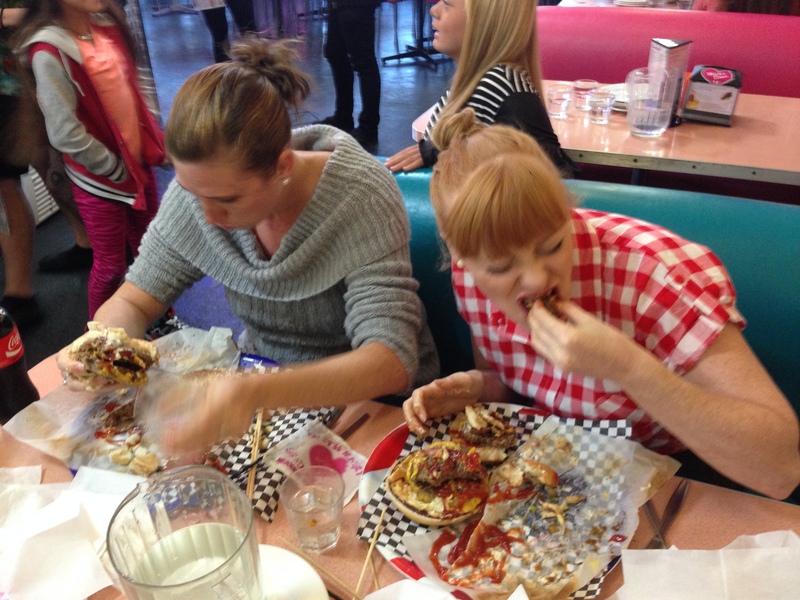 When Misty herself told me that it was a 1.2 kilo challenge, my gut sank. I did the maths in my head and was truly worried. This is before we even saw the burgers, not a great feeling going into it! Then the burgers came out and boy are they MONSTERS!!! Four. Teen. Minutes. Seriously? Apparently the record is 6 minutes 40 seconds, at which the mind boggles. 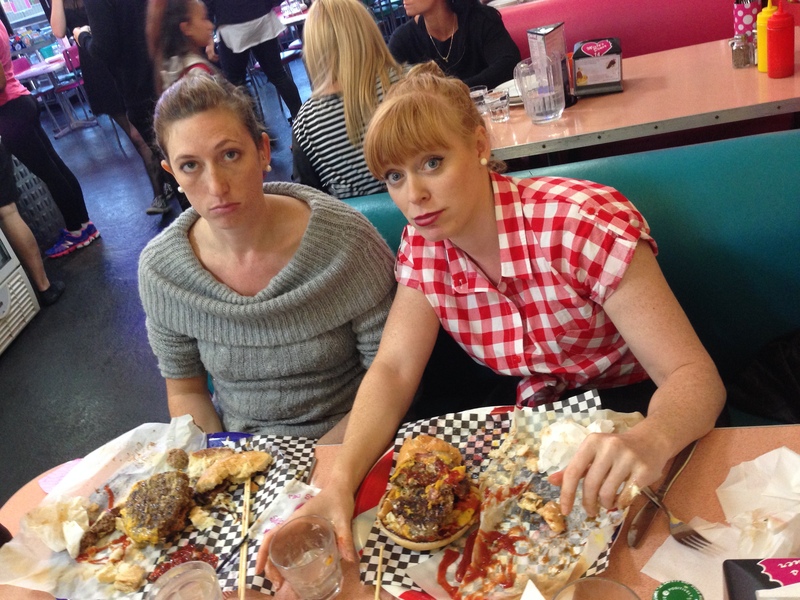 Daunted but not one to give up a fight before starting, we tackled that burger with all our might. I broke the top half off and just started going at it like a catfight in Frankston on a Saturday. Bamma went in extremely hard and had finished her sides within 2 minutes. 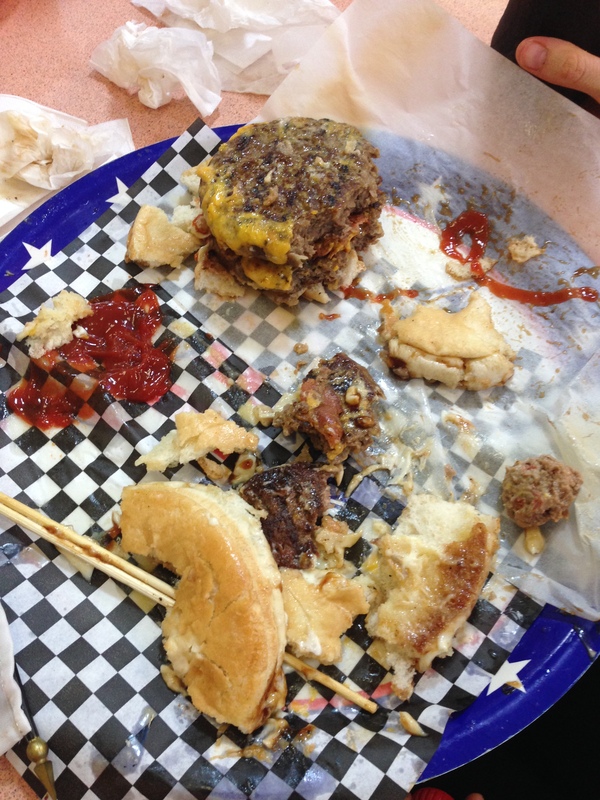 I was down about 1 pattie and half a bun. We were instructed to drink LOTS of water during and our lovely pit crew ensured that our glasses were always full but it honestly only took about 5 minutes before our jaws started to ache. That is some seriously hard chewing to get through such dense meat! You feel like you are chewing for 5 minutes on each mouthful, kind of like that dream where you’re running but not getting anywhere … just me? Then we were hit with the curse of the Swiss cheese. I honestly don’t know how such a tasty cheese for the first 10 bites can turn into something so vile, I was almost dry retching trying to get it down. Bamma coined the term “it tastes like cat piss in my mouth” which I have to admit is awfully accurate. No offence intended to Misty’s, they didn’t invent the damn cheese but I can’t get that taste out of my head. With about 5 minutes to go I’d finished all my chips and half the burger, with Bamma just a little ahead of me, when Misty brought in the ketchup. It helped, we were suffering awful flavour fatigue. The meat patties are rather juicy and delicious but so much of the same flavour makes you want to bit the table, just for something different. It was at about 4 minutes to go we both knew the jig was up. We had slowed down, not from being full (the stomach has 20 minutes before that happens) but from chewing and swallowing massive amounts of beef and bread. We could have given up as it was pretty obvious neither of us was going to finish, but that’s not the point! I think at that point we’d both managed to clear some room via the most ladylike of burps 😉 so we pressed on. You can see we’re not too impressed with the ending but Misty has assured us that this was a really great effort and we should be proud. I’m pretty chuffed at how far we got and I know I wouldn’t have been able to do any more in that time. I’m the turtle, not the hare. So that’s it. No more challenges with bread, cheese or anything with gluten or dairy, but at least I can say I tried. Without going into too much detail, 3 days later I’ve finally come down from the challenge. I have never felt so sick in my life as I did the day after. I actually hadn’t eaten any wheat or dairy products for a good 6 weeks prior so my poor body went into an almost catatonic state of stupor, lethargy and aching. If anything it’s convinced me to listen to my doctors and not eat the darn wheel of cheese. This is Bamma’s effort, what a champion! Top work there champ. I hope this doesn’t kill off food challenges wholesale! They’re so much fun to read about. They look amazing! Good effort! Thanks Jamie, finally stopped hurting after it.